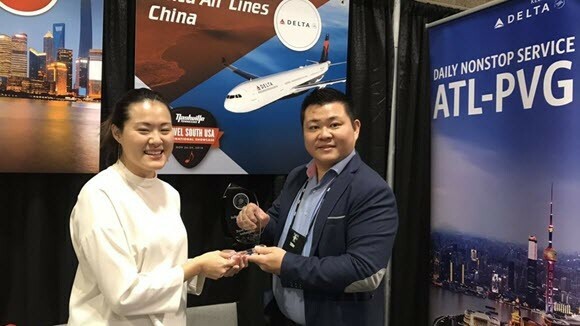 Delta's China Sales team was honored by Travel South USA, the official regional destination marketing organization for the southern United States, as the top U.S. airline contributing to the region's tourism industry. This award reflects Delta's new nonstop daily service between Atlanta and Shanghai, launched this past summer, and the increase in Chinese tourists that the new route has enabled. Samson Lim, Delta's General Manager of China Agency Sales, and Rebecca Keng, Specialty Sales Account Executive, attended a recent awards ceremony to receive this honor on behalf of Delta's China Sales team.